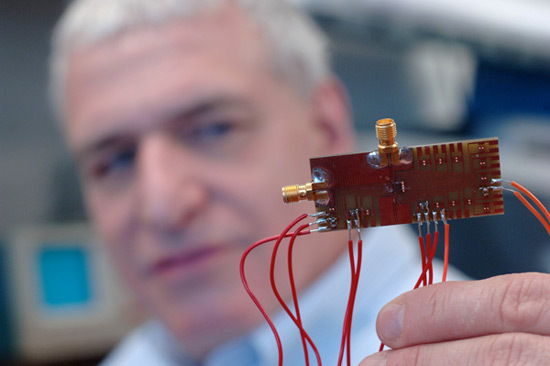 Eby Friedman, Distinguished Professor of Electrical and Computer Engineering, is an integrated circuit designer—his work plays a foundational role in the field of data science. Each integrated circuit is composed of billions of transistors—the building blocks of modern electronic devices—and each transistor has to fit perfectly in space and time with the billions of other transistors surrounding it. Friedman looks for ways to build faster integrated circuits that use less power by enhancing CMOS (a major class of integrated circuits and the industry standard) and exploring emerging technologies beyond CMOS. Friedman is also investigating novel 3-D design and integration methods. The trick here, he says, is to design a 3-D circuit where all the layers interact like a single system. It is similar to requiring different countries with different languages, customs, and rules to work together efficiently. This system integration process requires a design flow and methodology that enables the integration of these very different environments. The work of an integrated circuit designer needs to be transparent to the end user and is at the core of the electronic systems that we use every day, from credit cards to cell phones and countless other applications.